Serious reefkeepers will instantly recognize the name of John Veron. He is generally regarded as the world’s leading authority on scleractinian corals, and his work has been presented not only in a number of monographs and research articles but in his 1986 Corals of the Indo-Pacific and Australia. When this book was released, many serious aquarists acquired it, and few ever dreamed that this classic could be surpassed. But it has been – by John Veron himself, in his 3-volume set Corals of the World (with Mary Stafford-Smith as the science editor). As the title implies, corals from the Atlantic and Pacific Oceans are included in these volumes, as well as many newly-described coral species. Although Corals of the World was published in 2000 and Coral ID: An Electronic Key to the Zooxanthellate Scleractinian Corals of the World was released in 2002, I suspect quite a few aquarists have entered the hobby in the meantime and might not be aware these valuable volumes. There are many hobbyists who have since advanced to the stage where they can appreciate these works, as well. If you don’t have one or both of these works, you should. Here’s why. These magnificent volumes contain a wealth of information, with over 2,500 photos and 800 distribution maps (at the family, genus and species level). Eighteen coral families are here (divided into 66 genera and then hundreds of species). Almost all species have either close-up photographs of the each coral’s ‘skeleton’, or (even better) technical pencil drawings that show the corallum structure as few photos ever could. There is also a short section on non-scleractinian corals (including genera such as Millepora, Tubipora and others). Almost all photographs are ‘fresh’ and are not repeats from Corals of Australia and the Indo-Pacific. Aside from the obligatory Acknowledgements and Introduction, this volume includes an overview of types of coral reefs and discusses the important concept of zonation. This is followed by a chapter on geological history (where you’ll learn of 7 mass extinctions of coral reefs over the millennia). Eleven pages are devoted to coral structure which is important for coral identification. The excellent pencil drawings by Geoff Kelley are exceptional scientific renderings. There is a short section on corals in captivity, where Dr. Veron recognizes the importance aquaria can play in public outreach and education, their value as research tools and, lastly, as a way for developing island nations to protect and manage this sustainable resource while creating modest income. Volume One then gets down to brass tacks and examines Family Acroporidae, which includes genera Acropora, Astreopora and Montipora. There are a number of newly described species in the 268 discussed. Species are organized by ‘groups’ (38 for Acropora; 4 for Astreopora and 12 Montipora groupings). It should be noted that the internet version does not include all photographs. Those that are included are of reduced size and even when enlarged (and especially when printed) do not reflect the book’s quality. Even with the best print quality, the wonderful skeletal drawings are just a little ‘fuzzy’ when compared to those in the book. Also, there are problems with the scale bars on the internet site (the scale bars in the book are of the correct size). This ambitious endeavor has all corals listed in Corals of the World. While chapters are omitted about types of reefs, biogeography, etc., this compact disc contains keys to coral identification, which makes a difficult job relatively easy. The format is well thought-out, and it literally walks the user through the process. While its use can be made easier by understanding the terminology involved in coral ID, it is not mandatory as the keys have line drawings to use as a reference. Don’t know what flabello-meandroid means? Not a problem, all one has to do is match the coral to line drawings (see this month’s feature article entitled ‘Coral Identification Primer for Aquarists’). The CD includes 794 taxa, and with patience, almost any stony coral can be identified through answering up to 45 questions. The identification process is not always lengthy and some corals can be identified after answering just a few questions. Only occasionally does a book transcend the distinctions of multiple disciplines and interests. Corals of the World manages to excel as a coffee table book with its amazing photography, yet, for those willing to delve deeper, it becomes a useful resource for the casual snorkeler or experienced diver, an indispensable tool for researchers and taxonomists, plus an inspiration for reef aquaria hobbyists. And it does so at a price that makes it a true value. I have only one constructive criticism of Corals of the World. The undying myth that zooxanthellae are responsible for brilliant coral coloration is continued in this book. In all fairness, we know much more about the subject today than was known when these books were in preparation and now realize certain proteins within coral tissues are responsible for many of corals’ brilliant colors. Coral ID: An Electronic Key to the Zooxanthellate Scleractinian Corals of the World is a worthwhile addition to the library of any serious hobbyist. It offers powerful resources for the coral student and is an excellent research tool for anyone interested in underwater worlds. Here’s a bit of a surprise. I, along with a small group of hobbyists, had the pleasure of having dinner with Dr. Veron at one of San Francisco’s sideway cafés a number of years ago. It was a beautiful evening and the food (as would be expected) was excellent, but Dr. Veron regaling us with his stories made for a memorable evening. Of course, there were tales of students trying to trick him by presenting a Caribbean coral skeleton that they claimed was found on the Great Barrier Reef, or his daughter’s fascination with the underwater world. But we were astonished to hear that corals are not his true passion (astronomy, and especially star-gazing in the outback, is his hobby). One would never know this judging by the superb quality of his works on stony corals. They are unsurpassed and deserve to be on the bookshelf of every reef hobbyist. There are a couple of ways to get these books. The set can be directly ordered from the Australian Institute of Marine Science (www.aims.gov.au/pages/bookshop.html) – shipping of the books from Australian is expensive and slow (unless you opt to pay a premium for expedited shipping). Of course, the standard internet booksellers have the books, but check with one of Advanced Aquarist’s advertisers – Marine Depot (www.marinedepot.com) – they have an outstanding price on this 3-volume set. Other online retailers might offer it as well. 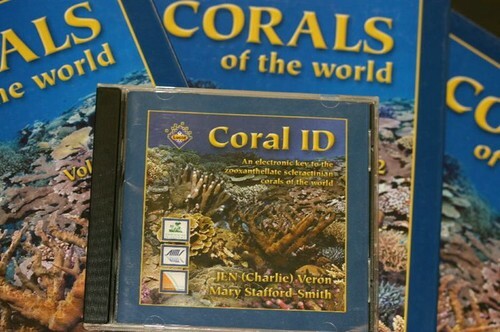 To my knowledge the Coral ID CD is available only through the AIMS bookshop. It has been my experience in dealing with AIMS that their shipping is quick, and delivery times are of modest duration. Postage (at least for smaller books and CDs) is reasonable.